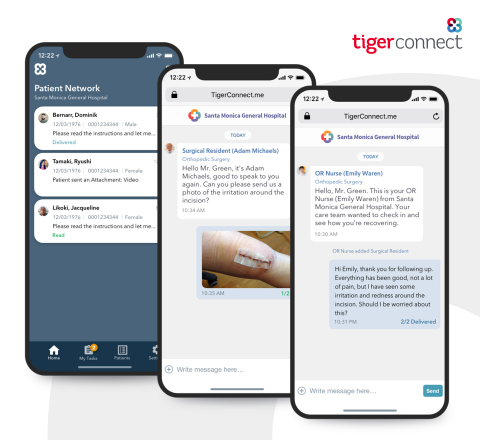 SANTA MONICA, Calif.--(BUSINESS WIRE)--TigerConnect, provider of healthcare’s most advanced, reliable, and widely adopted clinical communications and collaboration (CC&C) platform, today announced a series of major product enhancements to be showcased at the 2019 Healthcare Information and Management Systems Society (HIMSS) Symposium event in Orlando, Florida. Topping the list of product rollouts from TigerConnect is the proprietary “TigerTouch” solution, which enables health systems to communicate directly with patients through video, voice, and text. Improving Population Health Management – More frequent communication to a patient's preferred device can improve overall population health management. This can include medication reminders, after-care follow-ups, status updates, appointment reminders, and more. Virtualized Nurse Call Remotely Connects Nurses to the Bedside – More and more health systems are looking to enhance or even replace their existing nurse call systems with a communication platform fit for 21st century mobile communication. TigerConnect is introducing functionality that integrates with any nurse call system to allow a nurse or care team member to receive, route, and respond to bedside nurse calls and patient alerts. This communication saves enormous time while improving the patient experience. Virtual Care and Rounding Brings the Entire Care Team to the Patient – By introducing an easy-to-access and easy-to-use group video capability, TigerConnect brings the concept of virtual care to reality. Whether a patient is in a hospital room, an urgent care center, or at home, care team members can participate in group video sessions or text-based conversations to collaborate, share information in real time, and reach consensus around treatment options. As healthcare’s largest provider of clinical communications solutions, TigerConnect helps physicians, nurses, and other staff communicate and collaborate more effectively, accelerating productivity, reducing costs, and improving patient outcomes. Trusted by more than 5,000 healthcare organizations, TigerConnect maintains 99.999% uptime and processes over 10 million messages each day. Its category-leading product innovations and advanced integrations with critical clinical systems deliver high value for hospitals and large health systems.